I am a huge fan of Jackie Weger. Her books are not only entertaining but an experience that promise something new with each book. When I heard about her latest offering, Count The Roses, I jumped at the chance to review it and I am so happy to tell you that I loved every minute spent reading it! Now I have never been to New Orleans and Bayou Lafourche where the story in this book takes place. Living continents away, I was thrilled to visit a place so different in every respect from where I reside. I loved meeting the Cajun people and getting an insight into their history, beliefs and life which is harsh and yet so adventurous, nothing like the tame city life. Jackie paints a vivid, brutally honest and sometimes romantic and other times harshly daring picture where I felt every shift in the atmosphere and in the moods of the protagonists as if I was right there seeing and experiencing it all. It happened often in this story that while I followed the heroine in the city, in the Hotel where she worked I felt like I was travelling back in time to the seventies, the era of vibrant colours and daring fashion styles that, not being born then, I have only seen on TV in the shows of that time. The whole experience was just lovely and added more appeal to the story for me. The story is about two people who have faced traumatic experiences in their past that has made them wary of love. Totally different from each other, their love story takes them on a roller coaster of emotions with difficult decisions and compromises to be made to attain their happily-ever-after. The narration is fluid and crisp. The story moves quickly and held me captive right till the end. There are well planned twists and turns added to surprise the reader. The emotional play is admirably developed and I empathized easily with the characters. Not only are the characters of the protagonists fresh and complex, I equally loved the secondary characters who get an equal chance to shine and win the readers' hearts, all due to the expert execution by the author who shows not only her writing prowess but also her deep understanding of human nature through this book. I laughed and cried; learned a lot from this book and thoroughly enjoyed reading it! 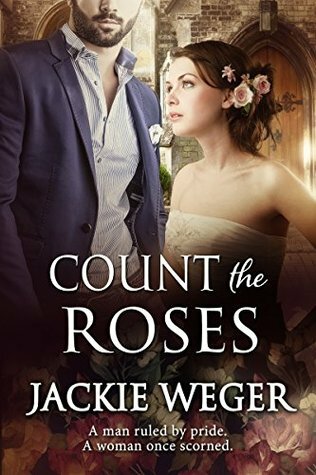 I can go on and on about it but to wrap up, I'll finish by saying that this book is an entertainer through and through, I absolutely loved reading Count The Roses by Jackie Weger and happily give it 5 super shiny stars. Recommended to all romance lovers, go grab your own copy of this lovely romance and enjoy reading it with a hot cup of tea. I received the book from the author to read and review and I am very thankful to her. The above review is my honest and unbiased opinion and in no way influenced.